Don't know your face shape? Don’t stress. Here are a few tips to help you figure it out. While all faces are unique, most tend to fall within one of the following categories. If you have an oval face, you’re in luck and can probably pull off any frame! Oval faces are versatile, balanced and gracefully taper towards the chin with a gently curving jawline. Your face is likely longer than it is wide and you probably have a wider forehead and prominent cheekbones. 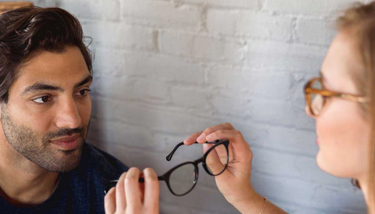 TIP: Most glasses will fit you well since your symmetrical face shape acts as a blank canvas. You can have fun with round, rectangular, or square shape frames. Plus, you can even play around with oversized frames (think: Jemison). You might want to avoid glasses with smaller and narrower widths. TRY: Turing, Roebling, Haro, Hamilton, Nash, Carver, Kepler, Hopper, Faraday, or Jemison.